It’s a nice thing to return to one’s own kitchen. I’ve been traveling for the last month, and while there were many wonderful meals prepared in a variety of different kitchens, there was a settling feeling in being back in my own. Yes, it was small. No, there weren’t as many ingredients as in my mothers’ pantry. But I knew where everything was. The sunlight was hitting the countertop just so. There was comfort in running my hand over mixing bowls and the kombucha jar. It felt good to be home. Or at least, in one of the many places that now feel like home. This first week back and there was already a dinner party invite. “What should we bring?” I inquired. “Just yourselves!” my friend responded. Just ourselves… nope, don’t think so. The invite was from a woman that knows a thing or two about good food, and we were being joined by the owner of a local organic/vegan/tasty joint of awesomeness that I happen to love, and I wouldn’t have dreamed of showing up without something homemade in hand. That’s a strict Foodie Underground policy. But still having not managed to loosen the tight grip of jet lag, paired with being behind on work, there wasn’t a whole lot of time to come up with some new fancy concoction to take along. Which is when I remembered the almond crackers. I know, I have a thing with ground almonds, but honestly I think that ground almonds make for food that’s a hell of a lot more interesting than anything made with conventional flour. And these crackers had become a spring staple before leaving for my trip. Having mentioned them a few times to my mother, while I was home, she kept insisting that I write down the recipe for her. “But you don’t really need a recipe for these…” I reminded her. Another classic policy of mine. Cooking comes from feeling, and even if I start with a recipe I tend to veer far from it. What I’m saying is that really this recipe should be: one big handful of nuts + a few spices + a little bit of olive oil and water, grind, mix, bake until ready. But that wouldn’t make for a good post now would it? The point is: feel free to experiment with this recipe. 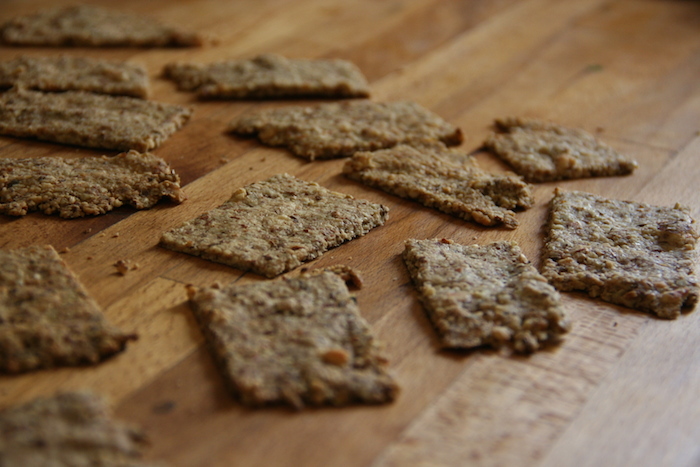 You can certainly make the crackers with just almonds, but I like throwing in a different nut or seed to mix it up. Sesame seeds work well because they’re strong enough that you get just a hint of their flavor, which happens quite nicely with the caraway seeds. If caraway isn’t up your alley, do something different! The point is that you get crispy, crunchy crackers that will blow any store bought thing out of the water. And you have an appropriate appetizer to take along to a dinner party. In a food processor, finely grind the almonds and sesame seeds. In a bowl, mix together the almonds, sesame seeds, caraway seeds and sea salt. Add in the olive oil and water and mix together until a ball forms. Form the dough into a flat rectangle on a silicone baking mat (parchment paper should work for this as well – although I haven’t tried it!). 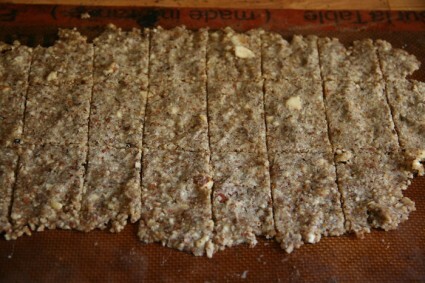 Now, here’s where we come to classic Foodie Underground cooking: find any almond-based cracker recipe on the internet and it will tell you to do something along the lines of putting the dough in between two plastic sheets and using a rolling pin to finely roll it out. Too complicated for my liking! I find that pressing the dough out works just fine, you just have to keep wetting your fingertips so that they don’t stick to the dough. Keep a bowl of water next to you while you press the dough out over the baking sheet. Once you have a flat rectangle, carefully cut the dough into even squares. I say “carefully” because if you’re on a silicone baking mat you probably shouldn’t be using a knife. I use the tip of a metal spatula. 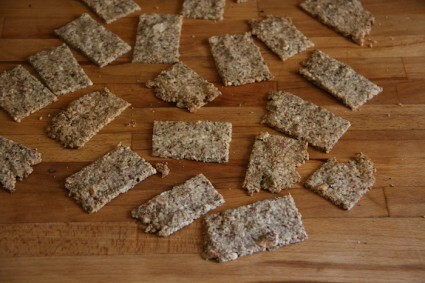 Bake at 400°F (200°C) for 12 to 15 minutes, until the edges of the crackers are a dark golden brown. Wholier-Than-Thou: Yes, There is Such a Thing as "Too Rustic"